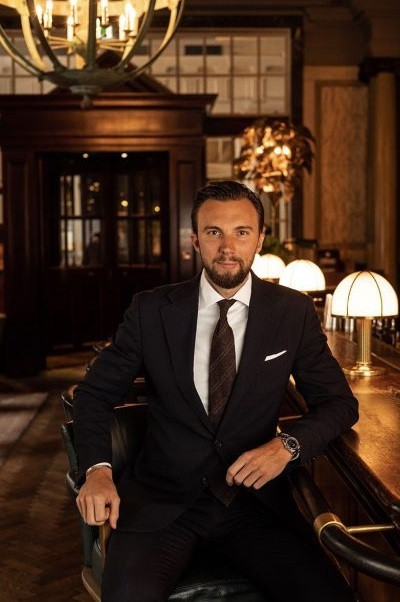 Rosewood London is delighted to announce that Martin Siska will take on the role as Director of Bars from 5th February 2019. Appointed Bar Manager at Scarfes Bar in September 2016, Martin Siska has brought a wealth of experience alongside a dedication to quality service and a passion and creativity for creating cocktails to the hotel since he joined. With over twelve years of experience in London’s luxury bar scene, Martin continues to lead the Scarfes Bar team alongside newly appointed Head Bartender Yann Bouvignes from strength to strength. Martin’s growth within his position has been illustrated through the development and launch of two new cocktail menus as well as the construction of successful long-term partnerships and collaborations with brands as well as the organisation of a number of guest shifts, pop- ups, and masterclasses in renowned bars around the world. This has provided exponential growth to the success of Scarfes Bar since he joined and the Bar has been nominated for a number of industry awards including Tales of Cocktails; Best 10 Hotel Bars in the World, Imbibe; Drinks List of the Year and Class Awards; Best Cocktail Menu. Using contacts collected from his experience in London, Martin has personally tailored and assembled a strong team at Scarfes Bar, with whom he has worked closely to bring a level of research driven innovation to the bar. In his time managing Scarfes Bar, Martin has led the team through the two most recent launches of the cocktail menus. Showcasing a meticulous attention to detail and creative originality, these menus have illustrated his view of mixing drinks as an art form and have featured cocktails based on the satirical sketches of the bar’s namesake, Gerald Scarfe. The menus have gained global recognition and two consecutive nominations at the much-coveted Spirited Awards at Tales of the Cocktail in New Orleans. Over the past six months Martin has been working closely alongside Yann and the team at Scarfes Bar to develop and create imaginative cocktails that will be showcased in a new cocktail menu to be launched in April 2019. Originally from Slovakia, Martin first moved to London twelve years ago and discovered a passion for bartending whilst working at D&D’s Pont De La Tour Restaurant. Martin then headed to HUSH in Mayfair before moving on to The Donovan Bar at Brown’s Hotel where he spent five years developing his knowledge and bartending skills. He was quickly made Head Bartender after just one year, instilling in him the high quality standards of service and team leadership required for a hotel bar. In 2015, Martin had the honour of spending four months working directly with the legendary Javier de las Muelas of Dry Martini in Barcelona, before launching its first UK outpost, Dry Martini London, as Bar Manager. After a successful launch period, Martin was promoted to General Manager and in 2016 he was appointed as Bar Manager at Scarfes Bar. Within his new role of Director of Bars, Martin will be responsible for the management of both Scarfes Bar and Mirror Room’s Champagne Bar. He will also act as consultant providing extensive knowledge, guidelines, training and expertise to The Gin Bar at Holborn Dining Room and any cocktail events held at the hotel. As well as this Martin will be involved in the Rosewood London’s yearly terrace pop-up schedule and will be in charge of signing off the cocktails program for the entire hotel. Rosewood London’s Scarfes Bar is inspired by the atmosphere of a drawing room and features a roaring fire, a collection of cosy velvet armchairs and over 1,000 antique books hand-picked by a Portobello antique dealer. Adorning the walls are canvases by renowned artist and caricaturist Gerald Scarfe, most famous for his political cartoons that have been featured in newspapers from The Sunday Times through to The New Yorker. There are over 70 caricatures in the bar, all of which paint a picture of modern political and pop culture life in Britain, with politicians such as David Cameron and Boris Johnson through to the Queen and her corgis and David Beckham on show. In an area of the bar dubbed ‘current affairs corner’ Gerald Scarfe regularly updates his artwork based on current political events. The overall atmosphere is one of eclectic, witty sophistication with complimentary live music seven nights a week. The exquisitely designed and intimate Mirror Room, sits in the heart of Rosewood London, with floor-to-ceiling decorative mirrors, low lighting and lounge style seating it is the perfect setting for a relaxed and social dining experience. Open from morning until evening with an elegant all-day dining menu, the Mirror Room is also home to the newly launched cocktail and champagne bar, an elegant and decadent spot within which to enjoy a selection of fine wines and champagnes during the day and a collection of champagne cocktails and a menu of light snacks, in the evening. Gerald Scarfe was born in London. He established himself as a satirical cartoonist, working for Punch Magazine and Private Eye during the early 1960s. He has had many exhibitions worldwide and more than 50 one-man shows. He has designed the sets and costumes for plays, operas and musicals in London, Houston, Los Angeles and Detroit. His film work includes designing and directing the animation for Pink Floyd’s The Wall and Disney’s Hercules. Gerald has written and directed many live action and documentary films for BBC and Channel 4 and has published many books of his work. Gerald has been a political cartoonist for The Sunday Times for 50 years, and his work regularly appears in many periodicals, including The New Yorker, Vogue and Tatler. Rosewood London, centrally located in the heart of London on High Holborn and housed in the original headquarters of the Pearl Assurance Company, showcases a sensitive renovation of the 1914 Edwardian, Grade II-listed building. Combining English heritage with contemporary sophistication, the retained Belle Époque architectural features include the original carriageway entrance to the grand courtyard and a spectacular Pavonazzo marble staircase which rises over seven storeys. The hotel has the feel of a stylish London residence and houses 262 guestrooms and 44 suites including the Grand Manor House Wing, an exclusive six-bedroom suite with its very own postcode. Tony Chi and Associates created the interiors of the public areas including 11 event spaces and the Mirror Room, serving elegant, innovative cuisine and afternoon tea. The Martin Brudnizki-designed Holborn Dining Room and year-round outdoor terrace offer British classics with a twist whilst Scarfes Bar serves creative cocktails alongside live jazz and cabaret. Rosewood Hotels & Resorts® manages 24 one-of-a-kind luxury properties in 15 countries, with 20 new hotels under development. Each Rosewood hotel embraces the brand’s A Sense of Place® philosophy to reflect the individual location’s history, culture and sensibilities. The Rosewood collection includes some of the world’s most legendary hotels and resorts, including The Carlyle, A Rosewood Hotel in New York, Rosewood Mansion on Turtle Creek in Dallas and Hôtel de Crillon, A Rosewood Hotel in Paris, as well as new classics such as Rosewood Beijing.